“As you know, we as a College blend into our professional Empire State Building setting via our dress code. While most college campuses do not have a dress code, the way we present ourselves is a visible indicator that The King’s College is not like most colleges. We choose to live by a higher standard.” —Eric Bennett, VP of Student Development Even though the dress code can be seen as a personality suppressor, some students have still found ways to express themselves through their clothing. Ladies and Gentlemen, I present to you: The King's College's Fashionista of the Month.” These students are picked for their exceptional style, attitude, and swag. 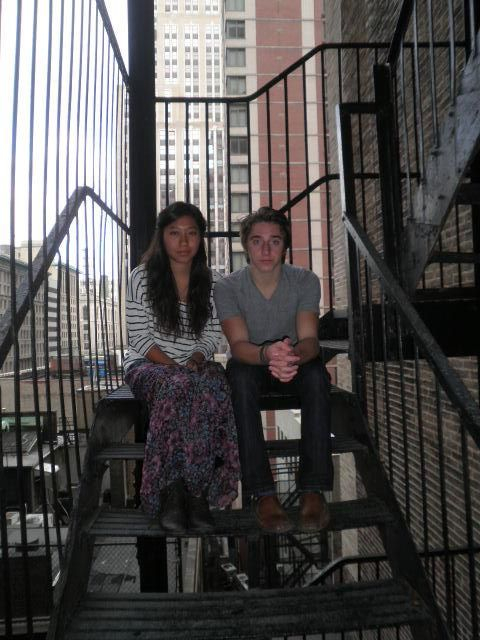 For the month of September, our Fashionistas are Aimee Pham and Nick Willeke. Aimee Pham, 17, is a freshman at King’s majoring in Media, Culture, and the Arts. She would like to work for a fashion magazine after she graduates. Nick Willeke, 18, is a freshman as well. His major is Business Management, and he wants to be a writer after he graduates. I had the wonderful opportunity to sit down and talk to them about their personal style. Shamaila: How much do you love fashion/style? Aimee: I love fashion, and I didn't even realize that I until I was thinking about what I wanted to do with my life. I eliminated all the stuff I didn't want to do. I didn't want to be a doctor or work in science or math, and then I realized what I love doing. I love reading fashion magazines. And that's when my love of fashion grew exponentially into something that was actually important in my life. Nick: I like it a lot because I just like to make a statement with what I wear. And I like to put things together that … say certain things about who you are. I like conveying that through what I'm wearing. Shamaila: What influences your style? Aimee: I buy clothes because [they’re] cheap and then from there I just try to make it work. So I'll find something for a dollar, and it's kind of ugly. And then I think, ‘How do I make this into something I'll actually wear?’ So it's not really something or someone, but it's whatever I feel like. And whatever I have in my closet. Nick: In terms of magazines and stuff, I really like GQ. They have awesome articles and have really good suggestions for style. They keep up on what's happening. James Franco has sweet style, so does Shia Labeouf. In terms of what I buy—I like buying major pieces of clothing … like a new pair of pants. I look at it like a major piece of clothing, and then I think of ways to put what I just bought with everything I already have. You just create outfits with that. You buy a new shirt … It doesn't have to be heavy. It doesn't have to be anything. I just look at it like a major piece of clothing, and you put everything else around that. You can create your own outfits that way. So that's how I look at it when I go shopping. Shamaila: Why even bother looking nice? What's the point? Aimee: I have to wear clothes anyways so might as well just make it fun, make it something I actually want to do. Nick: I disagree. I don't think you have to wear clothes. I mean we wear clothes because it's socially acceptable. And it’s the right thing to do. But yeah, if you're going to wear clothes you might as well look nice. It's one of those things about you that, when someone looks at you … they are going to notice. Superficially, not in a bad way, they will immediately notice what you're wearing, what you look like … and if you're pulled together. It says a lot about your mentality and your social life, and if you look nice, there's nothing bad about it. There are actually good things about it. You don't let it go to your head as you dress well and look nice. It tells people a lot about how you view things. Shamaila: Describe your own evolution of style. Aimee: In elementary school, I was really into Old Navy and I was really into Britney Spears. I wore Britney Spears and 'N sync shirts. I thought that was super cool. In middle school, I was really into Roxy, and I lived in California. With California beach clothes, Billabong, Roxy stuff, I thought that was really cool. Abercrombie and Fitch, freshman year, was the store to shop at. If you didn't have an Abercrombie shirt, you just weren't cool. Right around sophomore year, I started shopping at Urban Outfitters and more random stores online. I was in love with Anthropology, even though it's way too expensive for me. Then senior year I started thrift store shopping—Goodwills, Salvation Armies and random thrift stores around my town. Now I just mix patterns a lot. I just throw stuff together, and it kind of works out. If it's really messy, I'll just throw something on top that is really structured … I'll throw on a blazer and instantly I look a little bit more presentable. It's kind of this weird, crazy style—what I have now—but I like it. Nick: I have two older sisters, so both of them really influenced what I care about and how I dressed. I was always with them. I would go out with them, and they would get things. I knew all the name brands they would wear, but, because I was so little, I couldn't fit into any of them. So of course, I would want to look cool and hip and do what everyone else was doing. I didn't fit in Abercrombie and Fitch or Hollister, so I just did my own thing. In my youthful stage, I would wear sweatshirts, turtlenecks and sweatpants with no underwear, even in the summer time. I thought I was real cool, and then I went through an “emo” phase. Just a year of skinny jeans and big audio shoes, then the skater look, and then I went through a preppy phase. Then I just kind of got to where I'm at right now, and I really don't know what it is. It's kind of like I dress up one day, figure out how I want to look, and do whatever. Not everything in my wardrobe is the same. They are from different ideas and genres. I just put it all together and see what I get. Shamaila: What's the fashion like in your hometown? Aimee: There's actually a lot of well dressed kids in my home town. We have this thing called ABG--Asian Baby Girls. Around my town there's a big Asian community. They dress really, really well, but they all look the same. We have a bunch of hipsters, a bunch of surfer kids, and a bunch of skaters. A lot of style meshing together. Nick: Fashion in Detroit is … a lot less put together than New York. People don't put as much into every outfit. If you took someone from New York and put them in Detroit, they would definitely stand out. Describe your worst outfit ever. Aimee: I'd say this was around the 6th or 7th grade. It was a short white skirt with my one and only Abercrombie shirt, which was bright green. It had a huge reindeer in front of it, and then these skate shoes that were really big. I thought they were cool. The laces were purple, and then, my hair was in a ponytail, slicked back with gel. I look back and cringe. I can't believe I did that. Nick: It was 8th grade or freshman year when I bought all these pieces of clothing that I really liked. They were my favorite: my favorite pants with my favorite shoes, with my favorite belts with my favorite shirt. It was like this red and blue striped button-up with the stripes going up and down. On top of that, I wore my favorite hoodie that was blue and brown with stripes going side ways. Add the biggest studded belt and lime green shoes, and it looked terrible together. That's one of my worst outfits … or the turtleneck and sweatpants with no underwear. The EST wishes Aimee and Nick the best of luck in all their future fashion endeavors!